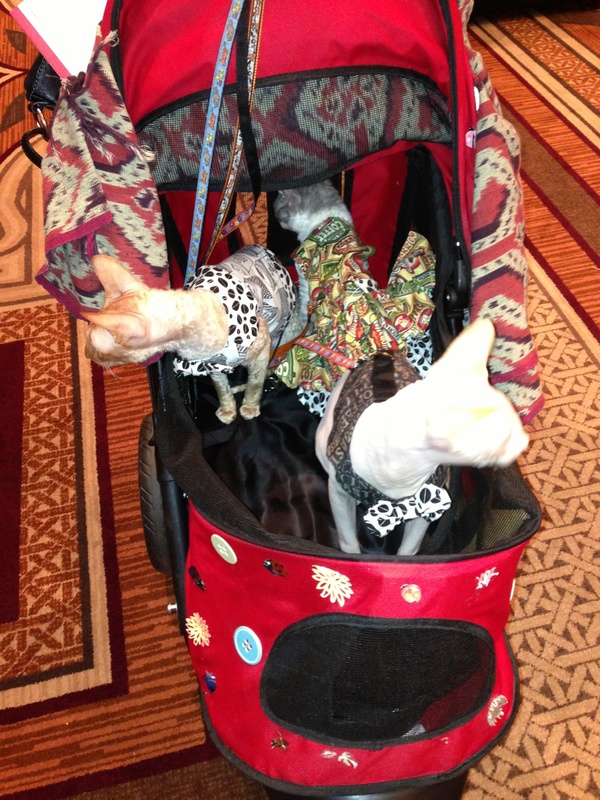 Plexidor Pet Doors: Cute visitors to BlogPaws! super cute and super popular. 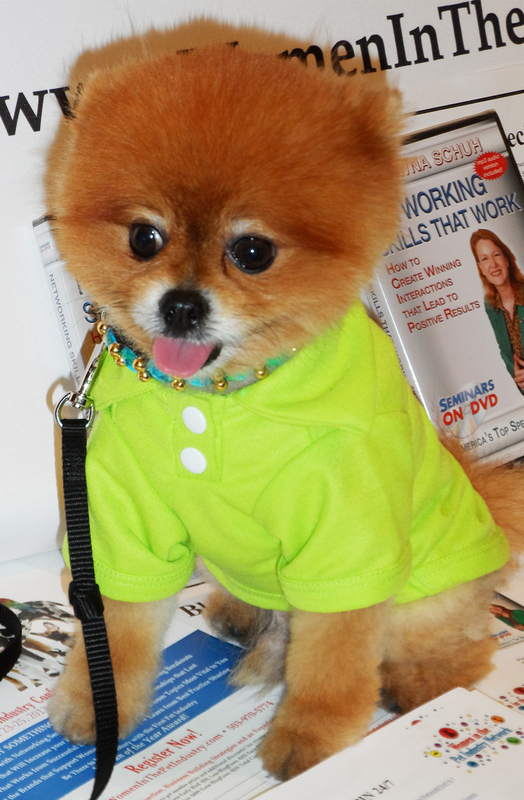 What truly distinguishes a pet conference from everything else? Well, pets, of course. BlogPaws had pets galore. To Dog With Love reports around 500 attendees and more than 80 dogs. There were also cats, ferrets, chickens, and even rabbits. Many smaller pets came in strollers pushed by their human families. Convenient way to see the world without risking too close contact with people's feet or larger dogs. The booth for Jones Natural Chews had a fun game - they asked visitors to name three of something in thirty seconds, and winners could choose a dog treat. I got the question, "Three kinds of carpet" and said, "Uuuh..." I'm Swedish originally, and carpet isn't a big thing there. Throw rugs are, but not carpets. Luckily, my colleague Robert came to my rescue. 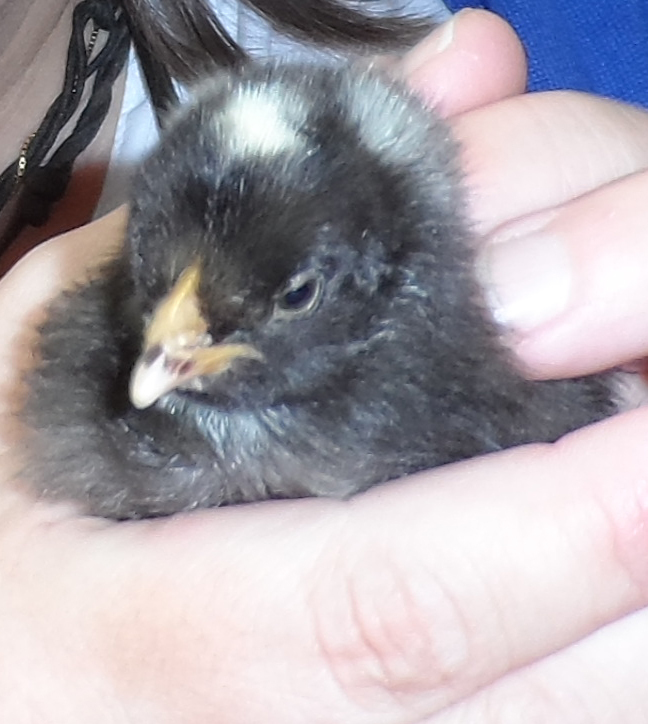 Anyway, they had chickens. I know that saying "baby chickens" is redundant since a chicken is a baby hen, but they really were baby chickens, just days old. Visitors were allowed to hold them, and one fell asleep in my hands. Awww! I wanted to take them home - predictably - but they weren't allowed on airplanes so bringing them to Florida was out of the question. They told me chickens are flock animals, and one should have at least three to make them happy. They like to curl up together. We met a woman with a stroller. In the front part sat a child, and in a back compartment was something I first thought was a blanket. When I looked closer, it turned out to be a rabbit. A very large rabbit. Maya holding a 34 lbs rabbit! I've forgotten its name, but it weighed 34 pounds. That's as much as my smallest dog. Rabbits have very sensitive noses, and they don't like when you touch their nose. I'm used to handling dogs, and when you meet a dog you don't know you don't want to come at them from above. Rabbits are allegedly the opposite; they don't mind too much if you pat them on the head as long as you leave the nose alone. 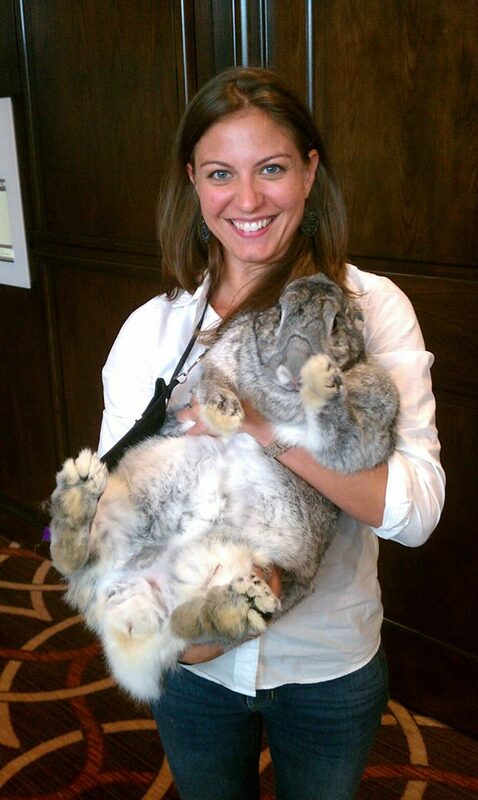 I also learned one should be careful when lifting them, especially bigger rabbits, because they have sensitive spines. One should hold them like a baby. Learning new things every day! There were also adorable ferrets. 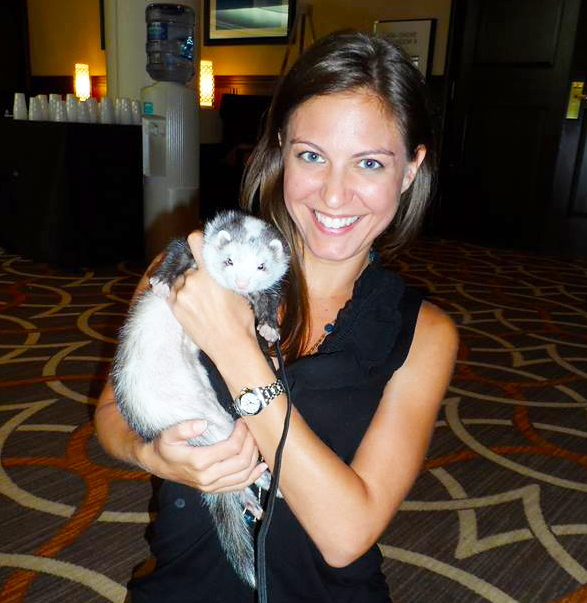 Here is my colleague Maya holding Snotface the ferret. He was a cutie. I thought ferrets were pretty active little creatures, but Snotface taught me they like to sleep. He would curl up in a nice and warm spot - like in someone's arms - and take a nap. They're allegedly very active in the mornings and evenings, but like to sleep during the day. There are ferret rescues, and one had a booth informing people about ferrets and their needs. The conference had many dogs, of course. Mine weren't allowed to come; I can see no way they'd be able to behave around so many people and other animals. It would be a herding frenzy. Luckily, many other dogs offered their services and allowed themselves to be petted. This guy's name is Moses and he was there with PetFinder. Moses is an absolute snuggle-bunny; he curled up on my lap for a nap. He behaved like a true gentleman, even though he surely was overwhelmed by all the people, dogs, cats, and other pets. I hope he'll get a fantastic home, where he gets to snuggle as much as he wants to. There were many cute cats as well. Most of them were in strollers, but a few were carried by their humans. I'm amazed at how well all the animals tolerated wearing clothes. My dogs have a "rip-tear" movement and pull everything off. Best case scenario, they can put up with wearing a bandana. Stay put: there will be more posts from BlogPaws during the week! OMG! That rabbit is HUGE! I think Moses is my favorite by far but awesome pics Maria! Oh, you would have loved Moses, such a gorgeous boy! =D Thank you for stopping by! Bren, Moses was GORGEOUS! If I didn't have 2 at home, I'd have gobbled Moses up in a heartbeat! Love the photos! I didn't get to meet Tito - but every time I saw him, I just had to smile! Some of those animals were totally amazing! Mom had no idea what to expect when she looked into a stroller! I liked that. It could be anything. 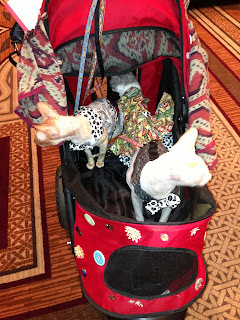 I was surprised every time I saw a human in the stroller, LOL!